The Mane Objective: Tip Tuesday: Don't Sleep on Hask for Natural Hair! 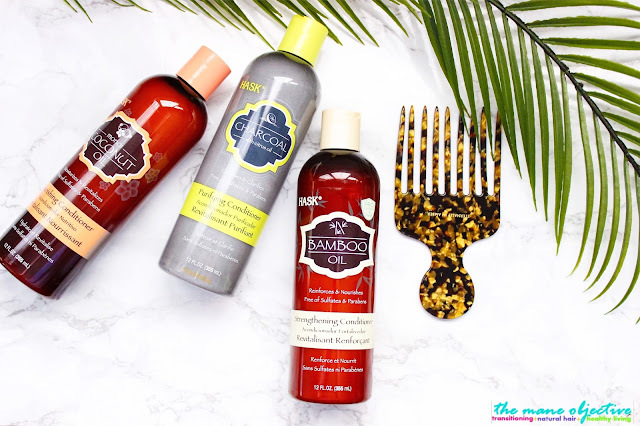 Tip Tuesday: Don't Sleep on Hask for Natural Hair! Can I be honest with you guys? Like, embarrassingly honest? I feel like you already agreed not to judge me, so let's go forward. I forgot that co-wash literally means to wash your hair with conditioner. Embarrassing, I know. But allow me to explain. See, you guys know how I feel about my beloved Bae Clean. It's the love of my wash day life. It's the Uncle Phil to my Aunt Viv. It's the cookie dough to my chocolate chip. I love this stuff, seriously. So it should come as no surprise that when my supply runs low (less than half a bottle), I panic. Recently, while on the brink of panic, I found myself scrummaging (scrambling + rummaging, you're welcome) for something to wash my hair with because my Bae was running low and I wanted to conserve. That's when I found myself in the bottom drawer, and I uncovered a half-used bottle of Hask Argan Oil Repairing Conditioner. Yes, Hask - the same Hask from your relaxed/heat trained Henna n' Placenta days. It had been a while since I touched it, and I couldn't remember why I purchased it to begin with. Then, I wondered to myself, "can I wash my hair with this?" Duh, Christina. Yes, it's conditioner. Co-washing is literally using conditioner to cleanse your hair. Co-wash away, for heaven's sake. So I did. And then, I remembered. THIS STUFF IS BOMB, YO! It will nevah, EVAH replace Bae Clean. But what it will do, is allow me to make my bottles last longer. To that end, I've even gone back to Ulta and purchased 4 more (BOGO 1/2 off + couponage = win) bottles to keep in my co-washing rotation stash. See, Hask has stepped their game all the way up - and I'm totally here for it. Let me explain why. Although I'm not an ingredient snob, ingredients do matter to me. I'm never here for drying alcohols, and I try to avoid harmful preservatives. I also curve mineral oil and petroleum, but make a special exemption for ApHogee Keratin 2 Minute Reconstructor. As a color treated natural, I gravitate toward ingredients that are going to strengthen, smooth, deeply moisturize, and improve elasticity in my hair. I love how each Hask conditioner is formulated differently, to meet the different needs of my hair at varying points in the month. If I'm hitting the Sauna one week (hey #EveryDayFitness), I reach for my Hask Monoi Coconut Oil Conditioner, because it's rich in Monoi (coconut oil + gardenia), Argan, and Linseed which moisturize, nourish, and sofen the hair while restoring elasticity. It also has Pro Vitamin B5 and hydrolyzed proteins further down on the list, lending a little strength to the mix. If I've been going hard in the paint with cardio, or need a little more cleansing power, I reach for Hask Charcoal with Citrus Oil. It's packed with activated charcoal powder and grapefruit and lemon peel oils to remove dirt, oil, and buildup while detoxing the strands and scalp. Lastly, for maintaining strong hair that doesn't break, I love Hask Bamboo Oil Conditioner. It's an excellent protein and moisture balancing conditioner, fortified with bamboo extract, hydrolyzed collagen, biotin, and keravis protein (read more about keravis protein here). It balances these strengthening ingredients with avocado, coconut, olive, and kukui oils, plus shea butter. Hask Bamboo Oil Conditioner is my favorite and go-to. Hask Conditioners are literally everywhere. Ulta. Target. CVS. Walgreens. Your Mom's Cabinet. Literally, everywhere. All under $6. Did I mention before how BOMB Hask conditioners are?! Like, seriously. Sometimes, haircare brands play this dirty little trick where they come out with 10 different products, with 10 different names, 10 different marketing gimmicks, and they all work the same. I can honestly say, I feel and see the difference in all the Hask conditioners I've tried. Yes, they all contain some of the same base ingredients (like water, cetyl alcohol, and glycerin) - but so does every single other conditioner on the market. They're excellent co-washes. Thick, but not too thick. Tons of slip. Free of artificial colorants, and fragrance is the LAST ingredient on the list. No, they're not CG friendly (hi wonderfully water-soluble cyclopentasiloxane), but my hair has always done well with silicones anyway. Whatever the case may be, they work epically well. There's like 80 bajillion different Hask conditioners, and for a product junkie like me, variety is the spice of life. I've used a handful (like the ones pictured in this post), but I'm looking forward to trying them all. You literally can't go wrong. And if you do, stores like Ult have pretty lenient return/exchange policies for hair products. Win win for product junkies everywhere! Welp, that's my cue to exit folks! I'm officially in love with Hask conditioners. This post isn't sponsored by them in any way - I just wanted to let you guys in on a little secret I've been keeping! Heck, Hask probably doesn't even know who I am, lol! Have you tried Hask? Let me know in the comments below! In the event that more individuals knew the advantages of sleep they could never stay up late again. Absence of sleep can make you lose your hair rapidly. In the event that you can't sleep a lot during the evening attempt to sleep before twelve. Grown-ups need between 8-9 hours of sleep each day. One thing that has helped me is just telling myself, “Well, if I’m going to be really tired and sleepy tomorrow, so be it.” It’s silly, but if said to myself with enough conviction, it helps me relax and not worry about falling asleep.